INDIANAPOLIS – A variety of new sights, attractions and promotions are available for fans this holiday season during Lights at the Brickyard, which is open now through Dec. 30 at the Indianapolis Motor Speedway. The popular, drive-through holiday display returns for a third season. Lights at the Brickyard features dozens of colorful displays totaling more than 3 million bright lights on a 2-mile course through the IMS infield and historic oval, including the front stretch and world-famous “Yard of Bricks” start-finish line. Enhanced displays: More than 500,000 new lights have been added overall, with more than three dozen new displays and a stunning new illumination of the front stretch of the oval. The new light displays include nine units showing the evolution of the Indy car, a 200-foot-long rolling tunnel, a 118-foot-long Christmas feast, a 20-foot-tall peeking Santa, an 18-foot-tall Iwo Jima Memorial, a 45-foot tall Borg-Warner Trophy and a tribute to late IMS Chairman of the Board Emeritus Mari Hulman George. Santa Nights at the Museum: Santa Claus will take time from his holiday work to visit the IMS Museum from 4:30-6:30 p.m. Sunday, Dec. 2 and Sunday, Dec. 9. Fun family activities, including photos with Santa, are planned. Fan photo opportunity: Fans can pose for pictures next to a large IMS-themed light display that will go live Thanksgiving week in front of the IMS Museum. A perfect shot for holiday social posts! Fan social media contests: Fans can vote on IMS social channels for new displays to be added to the course. The famed turbine-powered car already was a winner and will be unveiled in December, with one more fan vote to come. Cookies and cocoa: The holidays will be a bit warmer and brighter for Lights at the Brickyard guests when River West and Brickyard Smokehouse offer coffee, cocoa and cookies as concessions on selected nights. Stay tuned to IMS social channels for the exact schedule. Fundraisers: Non-profit and school groups will have the opportunity to pass on a special offer for fans to “save 10 percent and give 10 percent” to their groups from Lights at the Brickyard passes purchased from a special link. Groups interested in participating in this program should contact Lauren Guidotti at lguidotti@brickyard.com. Downtown décor: Fans should keep an eye out for Lights at the Brickyard displays in downtown Indianapolis, including at the Circle of Lights event Nov. 23, and at Circle Centre Mall, the IMS Pavilion at Bankers Life Fieldhouse and at the Festival of Trees at the Indiana Historical Society throughout the holiday season. 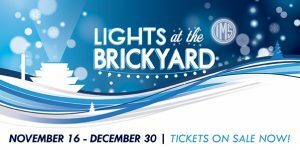 Tickets for Lights at the Brickyard can be purchased at IMS.com. Admission prices are unchanged from last year. Standard Lane admission will be $25 per car on Mondays through Wednesdays and $30 per car Thursdays through Sundays at the gate. Vehicles with 15 or more passengers will be charged $50 at the gate, with Standard Lane access. Standard Lane admission can be purchased only at the gate, with each admission valid for one drive through the displays per vehicle. The popular Speedy Pass also returns, allowing participants who want the quickest access to the course to skip the longer lines and arrive through a special entry near the IMS golf course. This pass can be purchased now at IMS.com for $50 per car through Dec. 30. Speedy Passes are $60 when purchased at the gate, with special midweek pricing to be announced. Operating hours for Lights at the Brickyard are 6-9 p.m. Sundays through Thursdays and 6-10 p.m. Fridays and Saturdays. Visit IMS.com for more information on Lights at the Brickyard. This entry was posted in Indianapolis Motor Speedway. Bookmark the permalink.